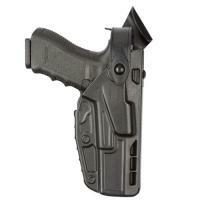 Looking for a duty holster that is rugged, durable and can withstand the harshest environments? Introducing the 7TS series of holsters from Safariland. Made of innovative SafariSeven™ material which is a unique nylon blend of DuPont™. The holster model 7367 is constructed with precision injection molding that is able to handle extreme heat to frigid cold conditions. This lightweight holster requires no maintenance and will protect and retain your firearm until you need it. The Safariland model 7367 provides an automatic locking system (ALS®) and a self locking system SLS rotating hood. When holstering, the gun will automatically lock in place even when SLS hood is down. The Safariland 7TS ALS Concealment Belt Slide Holster Model 7367 will provide a smooth single-motion draw each and every time! Belt loop fits up to 1.75"